CONCORD -- On any given day, men and women who have not committed or been accused of a crime are locked up behind razor-wire covered fencing at the State Prison for Men’s Secure Psychiatric Unit. 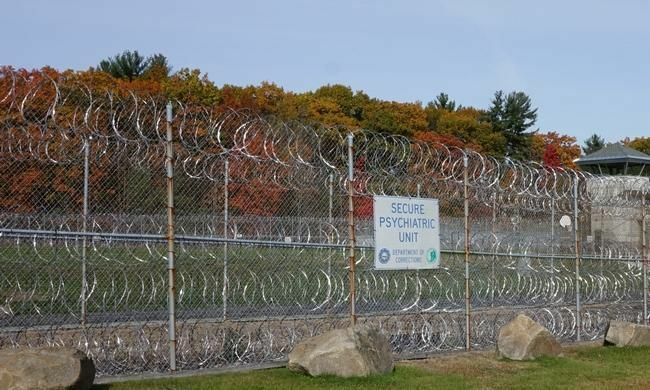 Wire fence near the entrance to the secure Psychiatric Unit at the NH State Prison for men. There are currently 15 men and one woman at SPU who haven’t been sent there for committing a crime, but have ended up staying anywhere from two months to one who has stayed for more than six years, according to Assistant Corrections Commissioner Helen Hanks. They were admitted to SPU because they are mentally ill and too dangerous to themselves or others to be managed at the New Hampshire Hospital, where such patients are usually treated, Hanks said. They are co-mingled in SPU with people sentenced under a variety of state laws including not guilty by reason of insanity and county or state prison inmates who are mentally ill and have been imprisoned for a range of crimes including murder, sexual assault, robbery and assault. “It shocked me to find out there’s people who have never been convicted of a crime who are incarcerated behind the walls of state prison,” said Rep. Robert Cushing, D-Hampton, who toured the prison facility recently with other lawmakers. Cushing was shocked, too, to see women in prison garb at SPU. There are a total of nine women housed in SPU with about 40 men. Altogether, there are 1,492 men in different units at the prison. “I did not know we were co-mingling female prisoners with males in that unit,” Cushing said. In the infirmary, the most secure ward at SPU, Cushing described seeing shackles that are used to restrain people. Cushing referred to locked telephone booth-sized “therapy booths” that resemble cages in which individuals participate in group therapy. Four booths that sit next to each other are visible through a glass partition in one room, in sight of anyone who tours the unit. InDepthNH.org also recently toured the facility. Inside the walls, SPU looks like a prison. Corrections officers staff a central booth keeping watch over the unit and are posted at different points around SPU. Patients do not walk freely in SPU. They are always with guards who unlock the heavy metal doors that lead to hallways on their way to their rooms, which also have locked metal prison doors. 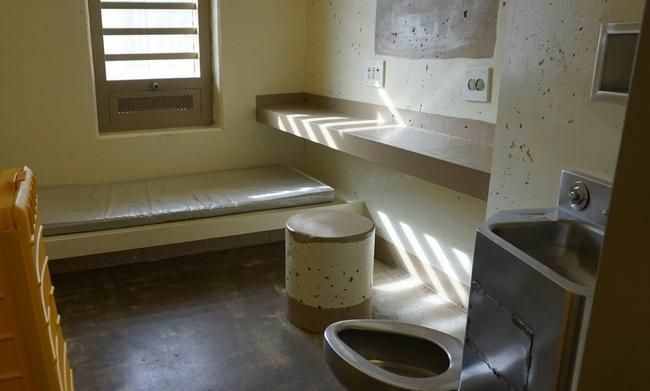 The rooms look like any prison cell, sparsely furnished with a bed, and a stainless steel toilet. There is a weight room, a small library, visiting rooms, kitchen area and a secure screened in concrete deck area. Women are housed in their own ward and have a separate day room. The visiting room is stark, as is the rest of SPU, except for bright orange plastic chairs. A separate Residential Treatment Unit is located up an open set of stairs from SPU that houses another 24 county or state inmates. It is a less secure environment where inmates are deemed well enough to be working toward returning to prison. InDepthNH.org was not allowed in the infirmary because it was considered too dangerous and was not allowed to speak with patients. A couple of the men gestured they would like to talk and have their photographs taken. Corrections Spokesman Jeffrey Lyons declined to release the names of people admitted to SPU and RTU – criminal and non-criminal - although the names of prison inmates are generally a matter of public record. “They are there for mental health treatment and have a right to privacy under state and federal law,” Lyons said after conferring with Assistant Attorney General Lynmarie Cusack. Cusack did not return phone calls. Gov. Maggie Hassan did not respond to a request for an interview. Rep. Cushing pointed out that the state ultimately loses millions of dollars in Medicaid reimbursements from the federal government because the patients are held in prison rather than a hospital. 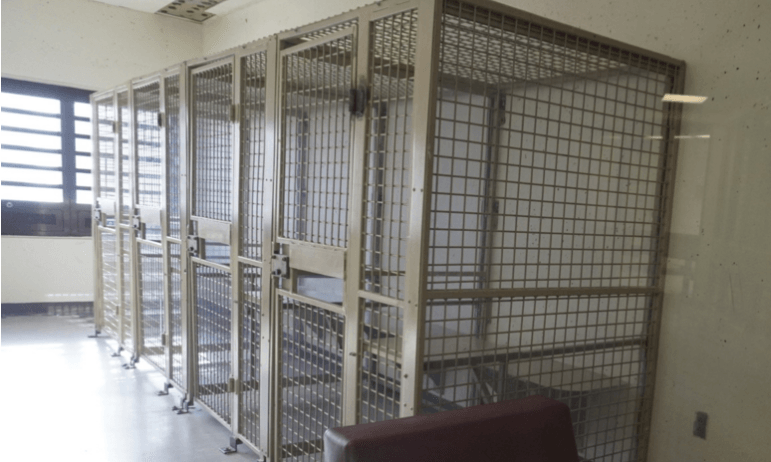 Heidi Guinen, deputy director of forensic services at the Department of Corrections, said everyone at SPU – convict or non-convict – is treated as a patient with mental illness, not as an inmate. Guinen said the goal is to return the civilly committed patients to New Hampshire Hospital as soon as they are well enough. “When patients are doing better, they go back to New Hampshire Hospital. Some unfortunately are here for a long period,” Guinen said. As to restraints for all of the people at SPU, she said corrections officers can use a restraint chair. “At all times, our policies are very strict on restraints. Medical staff and security are involved,” Guinen said. Patients are not commonly restrained in a face-down position, Guinen said. She did witness that type of restraint once when an inmate was out of control, Guinen said. “He had no clothes on and was banging his head against the wall to the point he was bleeding,” Guinen said. He was placed on his stomach for about two minutes to calm him down, she said. Some medical and psychiatric care is contracted to an outside company, MHM Services, and the rest is handled by Department of Corrections employees. Assistant Corrections Commissioner Hanks said the problems facing SPU clients are very complex. “These are people with major mental illnesses with sometimes violent, volatile behavior,” Hanks said. The staff includes nurses, psychiatrists, licensed therapists, social workers and a teacher, she said. “We do our best to provide a safe environment and to help improve outcomes for the clients,” Hanks said. State Rep. David Welch, R-Kingston, vice chairman of the House Criminal Justice and Public safety Committee, agrees with Cushing, but Parole Board Chairman Donna Sytek believes the current SPU system is working well to protect the public and patients. Sytek and Welch, both Republicans, have been involved in leadership positions with prison oversight over the years. Sytek was formerly Speaker of the House. “The issue is they are mentally ill and dangerous. (New Hampshire Hospital) wasn’t secure enough so we put the psychiatric hospital within the prison so they can get treatment within a secure place,” Sytek said. Sytek often reads reports about the medical and psychiatric treatment inmates receive at SPU when she is reviewing parole applications. “The mental health staff is terrific there,” Sytek said. “Frankly it’s an inappropriate place for someone who hasn’t committed a crime,” Welch said. “If the state hospital can’t handle them, they should have an area at (New Hampshire Hospital) that can handle them. Why put them inside a prison, for God’s sake?” Welch asked. A lawsuit could be devastating, he added. Cushing said he has fought this battle before. Two separate study committees have thoroughly examined the problem in the past. A legislative committee Cushing chaired in 2010 recommended building a new facility near New Hampshire Hospital for non-criminals in need of higher levels of security. “The problem is the legislature refuses to step up and accept responsibility for providing treatment to these individuals,” Cushing said. Cushing said his latest bill would require the corrections commissioner to seek more therapeutic alternatives for some of the people now housed in SPU. The state is mandated to treat all illnesses equally, he said. “People would be screaming if somebody had cancer and they decided rather than put them in a hospital to stick them in prison instead,” Cushing said.